Though not surprising, it’s nevertheless extraordinary to watch Donald Trump publicly and shamelessly morph into a George W. Bush era neocon when it comes to foreign policy, and a CNBC stock market cheerleader when it comes to the economy. Just like Barack Obama before him, Trump talked a good populist game on two issues of monumental importance (foreign policy and the rigged economy), but once elected immediately turned around and prioritized the core interests of oligarchy. Trump doesn’t even give lip service to big picture populist topics anymore unless they’re somehow related to the culture war, which works out perfectly for the entrenched oligarchy since the culture war primarily serves as a useful distraction to keep the rabble squabbling while apex societal predators loot whatever’s left of this hollowed out neo-feudal economy. The pivot toward status quo consensus when it comes to two of the most existential issues facing the nation should be deeply concerning to everyone, but particularly to those who thought Donald Trump would be different. When it comes to militarism and empire, Trump’s hypocrisy and bait and switch is one for the record books. Just as it became clear Obama was a fraud once he hired Larry Summers and Timothy Geithner (we later found out his cabinet was apparently chosen by Citibank), Trump placing neocons Mike Pompeo and John Bolton into key positions was a clear sign you could take “Make America Great Again” and flush it down the toilet. This administration is now laser focused on maintaining and even expanding imperial reach. Shortly after he made those comments, the infamous “28 Pages” were released showing how Saudi elites helped finance the whole operation. 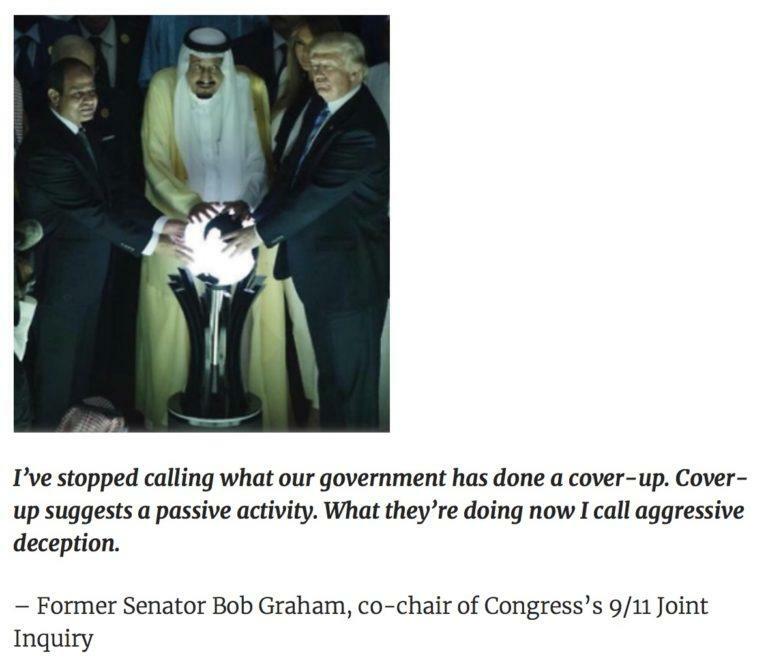 Did that stop Trump from making Saudi Arabia his very first state visit after being elected? Don’t be ridiculous. Donald Trump knows the score when it comes to Saudi Arabia. He knows about their role in 9/11 and he knows they’re the top global proliferators of terrorist ideology on the planet. Nevertheless, Trump is now enthusiastically tied to the hip with the Saudis, thus making him a defender and protector of the status quo. Defend him all you want, but this isn’t the sort of thing he ran on with regard to America’s foreign policy. Like other presidents who came before him, he campaigned on one foreign policy platform and then supports another once elected. In fact, Trump’s now so far off the deep end he’s widely expected to veto a measure recently passed by both houses of Congress to stop aiding Saudi Arabia in its ongoing genocidal war in Yemen. Congress passes bill to stop supporting Saudi genocide in Yemen. Trump is expected to veto it. Trump knows better when it comes to foreign policy, but he’s doing this stuff anyway. A similar thing could be said for his economic policy. 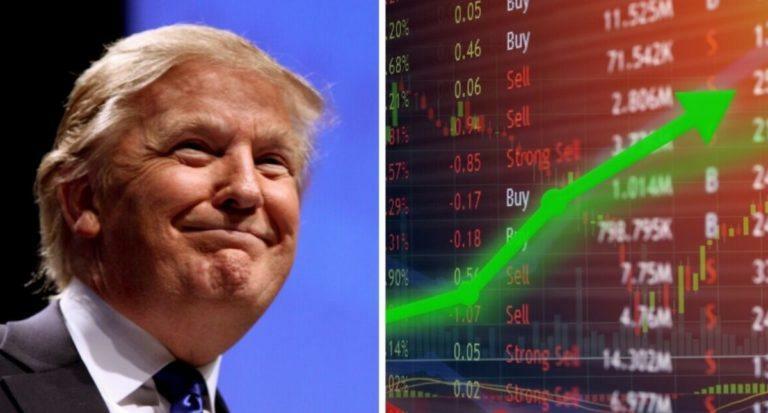 While on the campaign trail he accurately called what was going on in financial markets a “big, fat, ugly bubble,” but now that he’s in the Oval office, he can’t get enough of it — cheering on the stock market every chance he gets as if it means anything to the masses of people barely getting by. Meanwhile, back in 2011 Trump tweeted the following. The Fed's reckless policies of low interest and flooding the market with dollars needs to be stopped or we will face record inflation. Turns out QE led to massive asset price inflation and society-destabilizing wealth inequality which played a key role in Trump’s election, but he’s not concerned about that anymore. In fact, he’s now actively begging for more Federal Reserve money printing. I’ll take the other side. Trump is now publicly calling for more wealth inequality, which is what QE delivers. Many people naively believed Trump meant what he said on the campaign trail. They thought because he was already wealthy and not a career politician he’d get in there and really shake up the status quo on hugely important issues like foreign policy and the rigged, monopoly dominated, surveillance focused, financialized crony-economy. Well it turns out Trump’s just like everybody else. He doesn’t want to be the guy sitting in the White House when the scam economy and unsustainable empire collapses. I guess I can’t blame him, but it doesn’t make the situation any less dire for the rest of us. While there’s a very high probability that both the U.S. empire and the world financial system fall apart under Trump, it’s important to note that he didn’t create either one of those things. All the dangerous, outdated, corrupt and unsustainable things being desperately stitched together on a daily basis to maintain the status quo have been building up for decades. The entire global financial system is Enron as far as I’m concerned. It’s become clear no president will ever intentionally dismantle this ticking time bomb, it just has to play out on its own timeline. The important thing is to be honest about what’s really going on so you’re not completely caught off guard when the world changes faster and more dramatically than you could ever imagine in the years ahead. Liberty Blitzkrieg is now 100% ad free. As such, there’s no monetization for this site other than reader support. To make this a successful, sustainable thing I ask you to consider the following options. You can become a Patron. You can visit the Support Page to donate via PayPal, Bitcoin or send cash/check in the mail.